Since few months Mirakl solution is becoming more and more widespread; we found a significant number of marketplaces operating this new technology for marketplace management. Consequently, many brands have embarked on the challenge of starting their own marketplace and not without success; invested budgets are consistent, the technical solution being accomplished, robust, simple for the operator (the marketplace) and for the seller, most new marketplaces have carved market share and are generally, unlike global giants of the sector, sectoral marketplaces; DIY, home, garden, sport, perfume etc. Since 2014 we have implemented the API Mirakl that was not widely known, but now it is common knowledge that marketplaces like Darty, Rue Du Commerce, Galeries Lafayette, Privalia, Nature & Découvertes, Menlook etc. use the Mirakl solution. There are two reasons why we do not offer a general connector; firstly for technical reason, the listed marketplaces have all variations, specificities, usually business related and secondly because the sale of a module specific to the marketplace enables us to finance its support and development. This module does not allow the creation of products, simply because the marketplace already provides a simple and very effective product creation tool. However, the module will provide you an Excel file containing your products, attributes and features that will be imported with this tool, accessible from the back-office to the marketplace. In general technical support of marketplaces offer assistance with the integration of this catalog, so dealing with this file is easy. Scheduled Tasks: Manual or automatic. Automatic thanks to the free Prestashop Cronjobs module, the module automatically installs the scheduled tasks. If your marketplace is not in this list, do not worry; you only need to get in touch with your contact at the concerned marketplace and we take in charge the process. We simply ask the marketplace to provide a file with offers, specifications if necessary or if they exist, rectangular and square logo. We take care of the creation of the new module free of charge, the marketplace does not pay anything, the operation is free and allows the marketplace to integrate more quickly its prospects. Marketplaces that are partners have a visibility agreement with Prestashop and Common Services, and in this case, the module is available in Prestashop Addons. 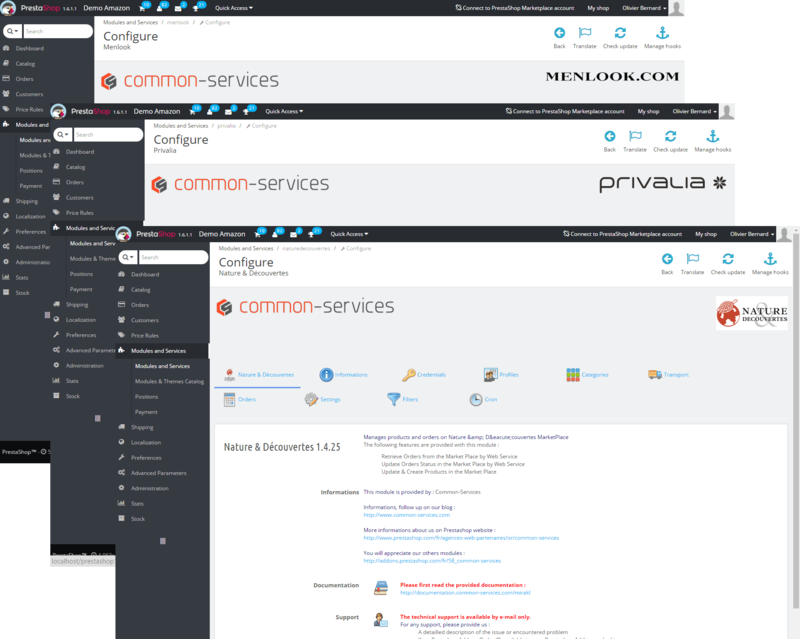 For marketplaces that do not have a contract, the module is sold directly by Common-Services. However, we prioritize marketplaces that are partners, our vocation is not to directly commercialize modules. To purchase a module that is not in Prestashop Addons or if you represent a marketplace, you can use the contact form to contact us.